Edmonton’s Lauren Crazybull has been named Alberta’s first Artist in Residence. The Artist in Residence program is a Canadian first and was designed to have the government support artists. With the residency comes a $45,000 grant and up to $30,000 in additional funding to help with travel and cost of materials. Described as a Blackfoot dene painter, illustrator and documentarian, Crazybull has recently focused on working with youth through art. “My practice is heavily informed by volunteering in community radio for years and working with youth in Edmonton’s inner city. I look forward to beginning this residency and meeting artists across Alberta to paint a portrait that threads stories and history together. Being given the opportunity to further pursue and broaden my practice in this way is a great honour and I can’t wait to share the journey and process with everyone,” said Crazybull. Her role commenced on January 1, 2019 and will run until December. She will spend the year travelling to communities in Alberta and promote the importance of artists and the arts, attend cultural events such as Alberta Culture Days and create a painted collage of Alberta using portraits and Indigenous languages. “Congratulations to Lauren on being selected as Alberta’s first Artist in Residence. Lauren is an excellent choice to act as representative and advocate for Alberta’s artists this year. 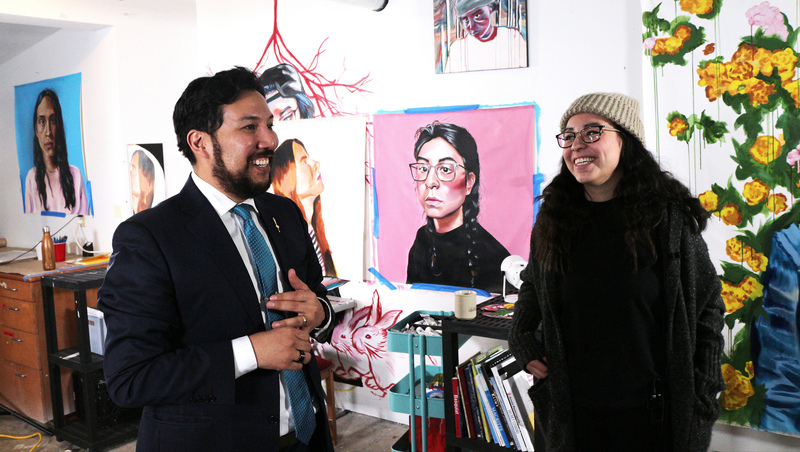 I am very excited to see the results of her work, both in the studio and in Alberta’s communities,” said culture and tourism minister, Ricardo Miranda. Roughly 100 people applied to receive the first Artist in Residence position in 2018. The position is open to all artists who live in Alberta and a near artists will be picked each year. Photo supplied: Culture and tourism minister, Ricardo Miranda with Alberta’s first Artist in Residence, Lauren Crazybull.